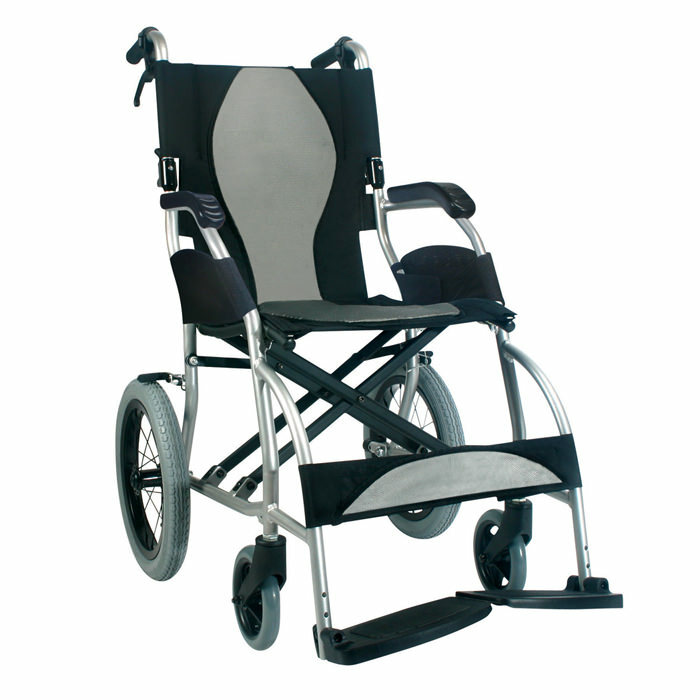 Karman healthcare ergo lite transport wheelchair features an ergonomically-designed seat and backrest, making it one of the most comfortable transport chairs. 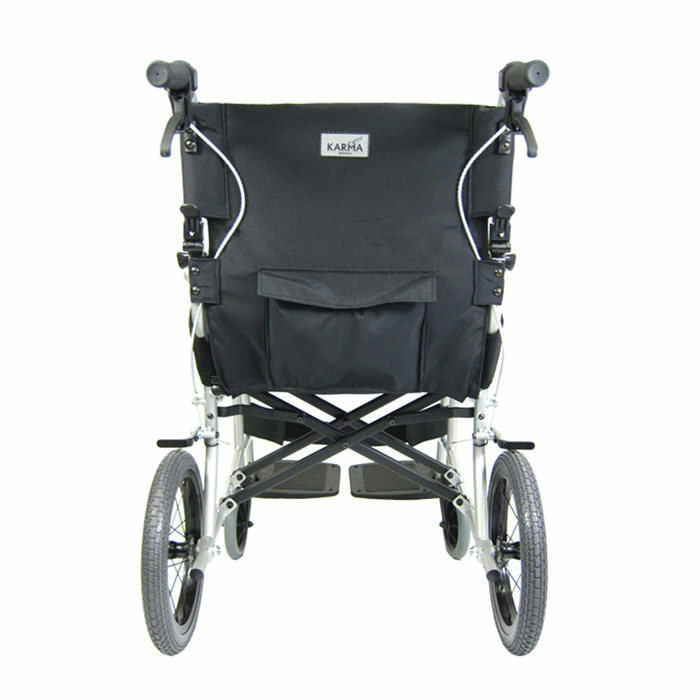 S-2501 is a lightweight transport wheelchair that weighs only 18 lbs. and is crash tested maintaining safety & high quality. The folding seat and backrest make the S-Ergo ideal for storage or travel, and the built in AEGIS anti-bacterial cushion provides added comfort and support. The ergo lite comes with fixed armrest with concave arm pads and footrest with wider footplates for providing better support to arms & legs while sitting. 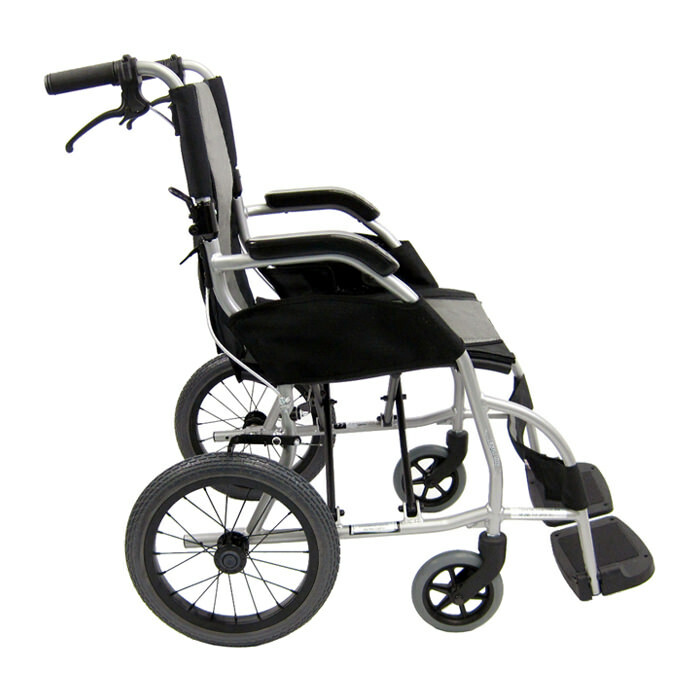 Ergo lite wheelchair comes standard with fixed footrest, folding backrest, cloth side guard, companion hill brakes, 14" rear polyurethane, high tread, flat free wheels and anti bacterial seat and back upholstery. Overall open width 23" 25"
Weight without riggings 18 lbs. 18 lbs. Weight capacity 220 lbs. 220 lbs. 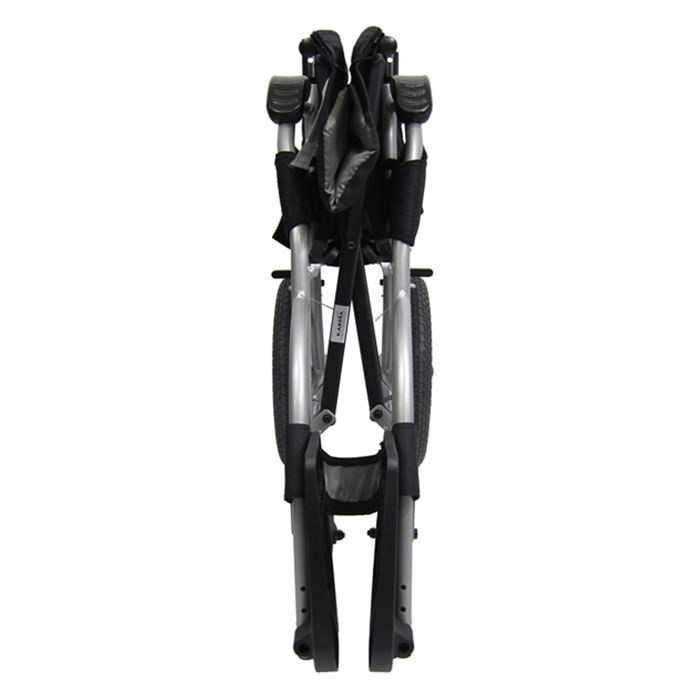 Manufacturer warrants this product to be free from defects in material and workmanship for a period of One year on frame including crossbraces, side frames and backrest frames from the original date of purchase and 6 months on parts. This warranty is extended only to original purchasers of our products. Parts or materials which are subject to normal wear and tear which must be replaced/repaired will be the owner’s responsibility and is not covered under warranty. Arm pads and upholsteries are not covered by warranty. It is recommended that any claims under warranty be returned to the authorized dealer for service through whom it was purchased from. Labor charge incurred in the installation or repair of the above-mentioned parts plus all freight charges are not included in the warranty. This warranty does not cover products which have been subject to negligence, abuse, improper storage or handling, improper operation, unauthorized modifications or misuse. Manufacturer will not warrant the frame or any parts damaged when the maximum weight limit is exceeded. The warranty is void on wheelchairs that have had the serial # tag removed or altered. Manufacturer’s sole liability extends to repair or replacement of parts or components as previously specified. The foregoing is in lieu of all warranties expressed, implied or statutory, whether written or oral. No return of any kind will be accepted after Fourteen (14) calendar daysfrom the invoice date and shipped back within 30 days shipped freight prepaid. Configured wheelchairs, special or custom products made to customer specifications or sold as non-returnable. Products returned in altered or damaged packaging, or in packaging other than original packaging will not be accepted. Package and/or product broken, breached, damaged or unsellable condition will not be accepted. Returns prohibited by each state has individual Pharmacy laws, all returns are subject to approval of Manufacturer Regulatory Affairs. All returns must have an RMA number (Returns Merchandise Authorization) unauthorized returns will not be accepted. Return authorization number must be marked on the outside of the box and ship back to Manufacturer. Goods accepted for credit upon return will be subject to a 15% handling/restocking charge and all transportation charges must be prepaid. For orders being returned for exchange in color, size, etc. the restocking fee will be reduced to 10%. Any returns thereafter will be a case by case basis depending on the product, situation, and subject to a fee ranging from 25-50% restocking fee, plus a minimum of $25 processing. Issuance of RMA number does not guarantee credit. Credit issuance is dependent on confirmed receipt/review and acceptance of RMA product back in Manufacturer Inventory and is subject to the other terms of this policy. Manufacturer will credit any freight and/or handling fee on the original order paid by the customer on returns that are due to a manufacturer error, and if all items on the invoice are being returned.